Writing has proven to be such a strong tool and means for cartharticism. It is a beautiful, messy, organized, raw and chaotic realness that is set free from the bondages of the depths from our inner most being. Writing is an expressive art form. It is poetic, it is dark, it is light and it is pure. What is said says so little yet can claim so much. What is unsaid can permeate echoes for all of time to come. As a former English major I have had the privilege to learn from amazing professionals the art of writing and the dedication and effort that goes into each unique piece that is written, read and/or published. Writing is both a gift and a talent. I fall in love and sympathize with others through their writings and release love and suffering through my own. Today I want to share just how cathartic writing can be and the value of keeping a journal but not just any kind of journal but rather a prayer journal. As a child and young adult I kept journals in which I would write out my feelings, things that were going on in my life; both good and bad and happenings with my family, friends, etc. As children and young adults our troubles are more than likely trivial compared to what we face as adults. However at any and every stage of our lives we will enface obstacles and challenges to not only overcome but to truly learn from. As a woman in my early twenties I had stopped journaling or writing out my thoughts and emotions. I thought at the time that it was time consuming and perhaps even juvenile. Furthermore I always feared writing exactly what was in my heart and/or subconscious because I was afraid someone, anyone would perhaps find it and ridicule me or judge me. Clearly my focus was not where it needed to be. I would write in code and though I was the only one who knew what it stood for, after a while I’d stop writing. I was writing to no-one. I was writing to air and so there was an emptiness behind my journaling. I wrote things down which helped me clear my mind at times but who was I addressing these thoughts to? I didn’t want to make up someone like a “dear diary”. I didn’t want to address myself because I was trying to get my thoughts and emotions out on paper to process them and I couldn’t ask myself for insight on the very things that were burdening me. I certainly couldn’t or wouldn’t address my entries to anyone I actually knew in “real” life because there was/is not one person on Earth that I would feel comfortable divulging all my sufferings, worries, turmoils or even joys and happiness with. I felt empty writing and as a result I just couldn’t commit. It was sometime after God touched my life in the year 2009 I believe that I started writing out my prayers. I started writing everything in my mind and heart and giving them over to God. I found the means of keeping a prayer journal not only cathartic but also essential in keeping me focused on what or whom I was praying for. My mind wandered less when writing out my prayers. My eyes skimmed the pages and triggered reminders within myself of whom or what I had left out of my prayers that I had initially intended to pray for. Writing out my prayers would become my preferred method for prayer. It allowed me to release everything or almost everything onto paper. It allowed me to take the time to share my life and moments with God and cultivate a stronger union. Later on, it served as a record of prayers requested, answered and still pending. Looking back on my prayers I am able to see how far the Lord has brought me and how much I’ve grown as a person. Below I’d like to share a few tips on starting a prayer journal. Choose a journal that attracts the eye. We want to feel encouraged to write and to have a designated place to jot down our thoughts, hopes, dreams, failures etc. There are various ways to go about this. I’ve met individuals who set up secondary email accounts so they are able to write out their prayers in their primary accounts and have a safe and secure place to send their petitions. I’ve met individuals who write out prayers on notecards and store them in a “prayer box”. There’s no right way or wrong way to go about this. Some individuals prefer lined notebook paper. Others prefer blank canvas sketch books. I personally opt for bounded lined journals that attract my eye by appearance and that also have scripture quoted in the pages interiorally. The scriptures can help us to reflect and meditate when we can’t think of anything to say or write. Adopt a method that suits you best. If you take time to Google “prayer journaling” or “how to keep or start a prayer journal” you will be inundated with hundreds of different methods and variations. Some will advise you to start with scripture, others will provide acronyms for meditating over biblical verses and reflecting your thoughts and emotions as the Holy spirit stirs you. Many will advise setting up a journal in such a way where some pages are designated for giving thanks and praise, others for petitions and some for biblical reference and interpretation. 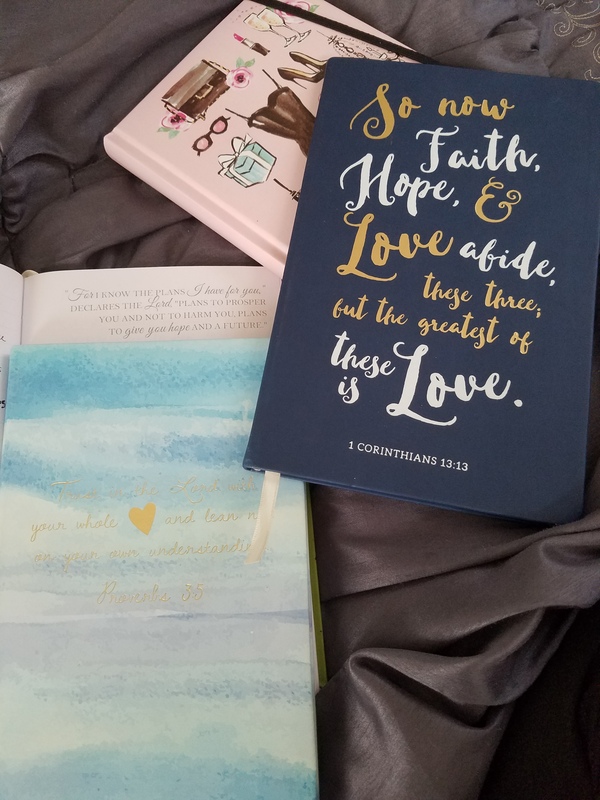 At one point I felt that my journaling and prayer techniques were mediocre and so I decided to purchase a beautiful bounded journal as such and designated different areas for different purposes. It didn’t work for me. I became overwhelmed by going back and forth through pages and became focused more so on technique rather than the relationship that I wanted to cultivate by journaling. In the end my frustration led me to discard the journal and played a role in my hiatus from prayer journaling. I believe simplicity is key. The importance of prayer journaling is simply engaging in an open dialogue with God in which we are willing to go to him and are receptive in his ability to speak to us and transform us. Set aside time to write. Setting aside time to write can seem daunting and overwhelming. How many of us pray before we retire at night only to fall asleep during our prayers? How many of us give God a quick 2 minute or even less of prayer time before closing our eyes and drifting into deep slumber? There are times I see myself fall into this habit for maybe two or three days in a row. By setting aside time to write, be it 15 or 30 minutes we are making a conscious intentional effort in creating that dialogue. By waking up early to begin our day with His presence we are welcoming Him into our day. By writing at night we are cleansing ourselves of the day. Sometimes I’ll wake up early and use that time to write. Other times I’ll do so at night. Some times I go long stretches without writing. Prayer journaling is definitely an intentional act that requires effort and dedication. Consistency is key. Be intentional. Quality over quantity. You don’t need to spend hours journaling. Sometimes just a few sentences is enough. Sometimes bullet points of the individual’s names or concerns are enough. Sometimes just a thought or reflection is enough. Review your entries. Reviewing your entries is a point I’d like for you to implore with caution. During the darkest times of my life I journaled to no avail. I wrote down every wrong, every detail, every hurt that an(other) individual(s) caused me. It aided in releasing the pent up emotions from inside me. However when I returned to read those entries I relived those experiences for a second, third, fourth, fifth time. The mind cannot differentiate from reality and subconscious. I returned to a state of pain and anguish and despair. Hatred would brew in my heart. I’d reread entries such as “God where are you in all of this? !” “Why are you allowing this amount of suffering in my life? !” “How can I trust you when you are no where to be found? !” My prayers were real and raw just like the pslamist. Though now I wish I had saved those entries to prove how far I have come, at the time the emotions and words recorded in those journals were weighing so heavy in my heart that I felt the need to discard them. They were full of so much pain and anguish that I never wanted to relive those experiences not even by the words themselves. When reviewing your entries I recommend going at least 3-6 months before rereading them or as long as it takes to complete your journal. Remember we are reviewing them to reflect on how much progress we’ve made through our prayers and just how much God has blessed us not as a means to revisit or rehatch the past. Make note of that. Be real. Tell God exactly how you feel. Don’t hide it. Don’t harbour it. God can handle it. If you’re angry at God, tell Him. If you are happy, joyous and thankful, share it with him. Being authentic and transparent will only benefit you furthermore. Keep your journal secure. If someone read my journal today that would be their own doing. My writings and thoughts and prayers are meant to be between my Lord and myself. As adults we must realize that gone are the days of our childlike limitations and fears. What I share is between God and myself. What you share with God is between God and yourself. It’s no-one else’s business. There have been times that I’ve shared an entry or two with a close friend or family member just to shed tears and again reflect on inner growth but that was at my desire and discretion. Because we choose to be raw and real I recommend keeping your prayer journal safe and secure. 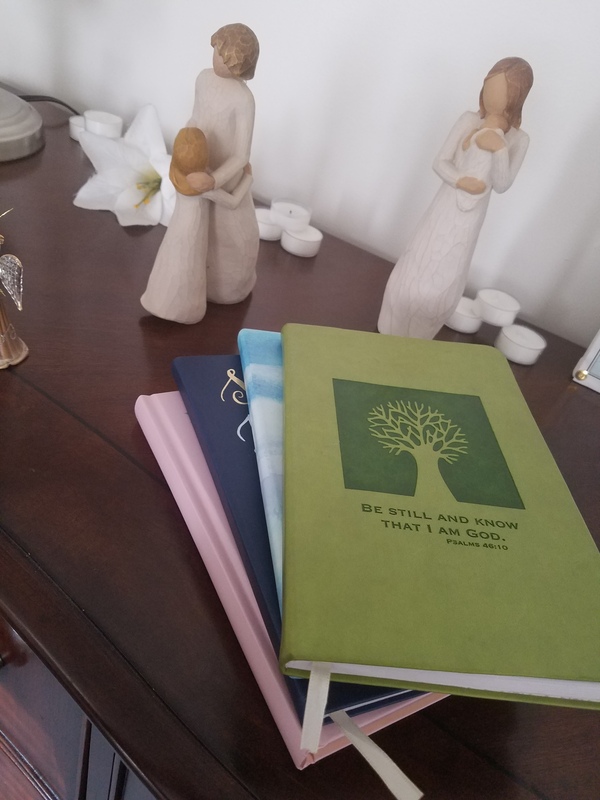 My prayer journal is typically found in my livingroom or bedroom in the open. My children know what it is and know it’s my conversations with God. I don’t worry about guests seeing it because I know the privacy within my home is respected and so therefore I’m at liberty to leave it out. If you don’t have such privacy then I advise finding a secure location for it. Remember, we’re not children playing “dear diary” but we are adults getting honest and real and pleeing and divulging with God. Give it time. As with anything in life time will tell it’s story. There is no right or wrong way to prayer journal and for some prayer journaling will not be their preferred method of prayer. Understand and acknowledge what does and does not work for you. Give it time and you may be surprised at the true value and treasure it is to implement prayer journaling into your life.